WORLWIDE MEDIA BROADCAST BRINGING NEW ARTIST MUSIC, GLOBAL NEWS AND THOUGHT PROVOKING TALK RADIO. FOLLOW US ON FACEBOOK, TWITTER, YOUTUBE, AND SOUNDCLOUD. WHAT NEEDS TO CHANGE IN HIP HOP TODAY!! THE YOUTH IS THE FUTURE!!! To broadcast conscious music mostly in the form of Hip Hop Rhythm Music. To broadcast public talk show that will illustrate informative knowledge that will improve our society by changing the genre of music that will suggest positive thinking in the youth & young adults. To change the thinking behavior and illuminate the character defects in the youth & young adults in our society. This will be service to the public and mutual benefit for all diversified communities across our nation. 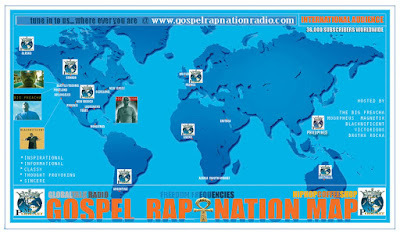 To broadcast gospel hip hop music and conscious contemporary music. To broadcast talk radio setting forth various conscious subjects. We strong believe in the importance of programming our broadcast that will change the subliminal thinking process that is currently placing our society into chaos. We believe furthermore that the masses that listen to our program will benefit from the results in positive behavior patterns both youth and young adult alike. Initiate violence prevention concert rallies targeting the youth mid-school, to high school age illustrating films and educational documentaries on reducing the recidivism rate of incarceration, and providing this program as a service to diversified communities across our nation. Our interpretation of G.R.N is just delivering the “the truth” and truth is what we support based on individual experiences. Artist in our playlist that is aired we will assist in their careers and participate in there promotion. Our shows will be done by music playlist of various great new artist music both published and unpublished material by consent of the artist. Programs will also be consisting of live talk forums obtaining content of various subject matters, (Social, Religious, Economical & Political), and basic conversations of small motivation speeches. To furthermore provide a platform of undiscovered talent in various diversified communities across our nation. A. To establish a positive message, teach and apply tools and promote the good news through the vehicle of positive upliftment music. B. To promote information that relates to the youth and young adults in our society towards improvement. C. Broadcast music that uplifts our society in difficult times. Identify problems in our society, research and learn to establish solutions. D. Advertise to our listeners various products and services that can bring growth to our economy. E. To allow Gospel Rap Nation Outreach to be used as a positive medium of information as we make an effort to turn the tide in our country’s culture today. F. Initiate VIOLENCE PREVENTION MUSIC CONCERT SEMINARS targeting the youth mid to high school age illustrating films and educational documentaries in reducing the recidivism incarceration rate via scared straight programs broadcast, and providing this program as a service to diversified communities across our nation. Provide and assist our communities in networking referrals obtaining growth to our listenership base in various counties across our great nation.